1830: Baron Zorn believes his family to be tainted with insanity and keeps his son, Emil, and daughter, Elizabeth, under lock and key at the castle. But Elizabeth has escaped and has met medical student Carl Richter, who has fallen in love with her. When she is recaptured and taken back to her confinement, Carl sets off on her trail, determined to find her again. Meanwhile, when Emil, a dangerous psychotic, murders a local girl, the outraged villagers, egged on by a fanatical priest, vow to rid themselves of the ‘demon’ in their midst. It is the beginning of the tragic and bloody downfall of the Zorn dynasty. 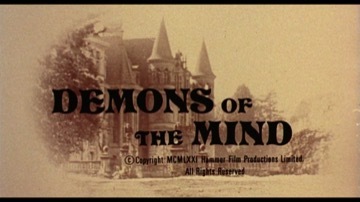 Peter Sykes went on to direct Hammer’s last horror film, “To the Devil a Daughter” (1976). Hammer appear to have been grooming Shane Briant for future stardom. He has parts in three more of their films – “Straight on till Morning” (1972), “Captain Kronos Vampire Hunter” (1972) and “Frankenstein and the Monster from Hell” (1973). Michael (later Sir Michael) Hordern was a much respected stage and screen actor. His other films include “Scrooge” (1951), in which he played Marley’s ghost, “The Spy who Came in from the Cold” (1965) and “Theatre of Blood” (1973, with Vincent Price). Paul Jones was previously the lead singer with the pop group “Manfred Mann”.